With the beautiful summer weather we’ve been having, it seems a little strange to be sewing with Halloween fabric, but that’s what I’ve been doing. I was excited when Carina Gardner asked me to be a part of the blog tour showcasing her new fabric line called Eek Boo Shriek for Riley Blake Designs. I didn’t even have to see the fabric, just hearing the name made me want to be a part of it 🙂 Below are the four fabrics I chose to work with. That skeleton print is cute, but I am a sucker for tiny polka dots and HAD to get some of that print! My plan is to have this on our coffee table in October with our Halloween candy dish, but I didn’t have any candy for the photo shoot last night, so I pulled this pumpkin out of the closet as a substitute. I think it looks pretty good too. I ended up doing a full crosshatch just in the center orange section and left just the diagonal lines for the outside corners. The design works out well and doesn’t make me feel the list bit bad for not doing crosshatch on the entire thing. HA! My favorite fabric from this bunch is what I used on the back. 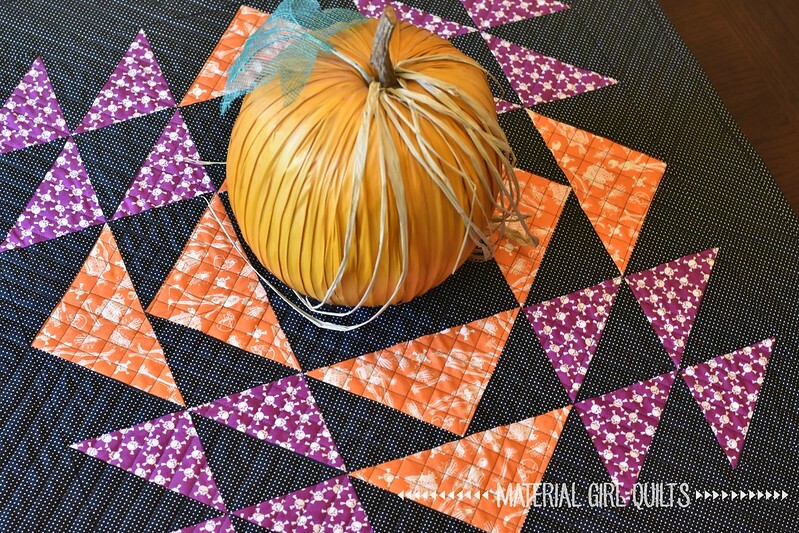 It’s a perfect print for quilt backs and Halloween treat bags. I think I might have to make some of those next. My quilt design is based around one very large 24″ finished block that I found in EQ7 titled “Homespun”. Then I added 4″ borders to frame it up nicely. The finished quilt measures 32″ square. To see some other awesome projects made with Eek Boo Shriek fabric, check out the blog tour line-up below. 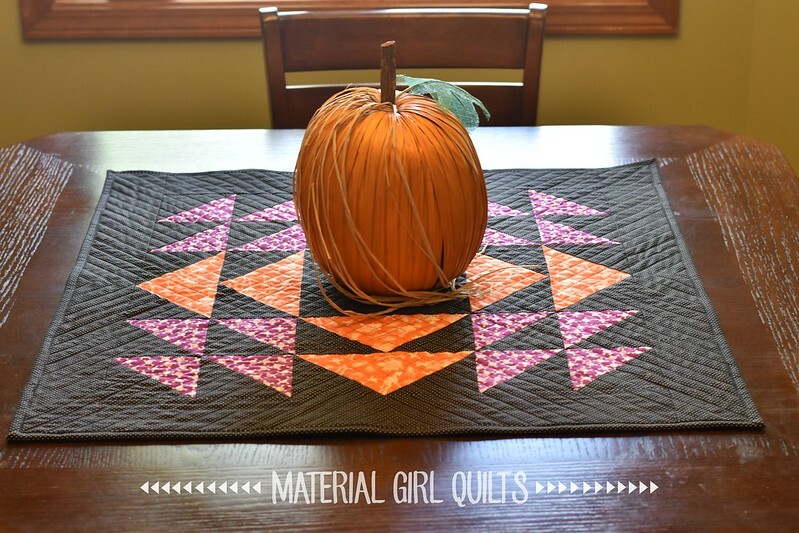 Yours is a super table topper and a perfect match for the fabric collection! I can totally “see” how you could get dizzy with those polka dots! If I get time, I hope to follow your tutorial to make one myself! Thanks! Just adorable! I could see using that block for seasonal table toppers of all kinds! 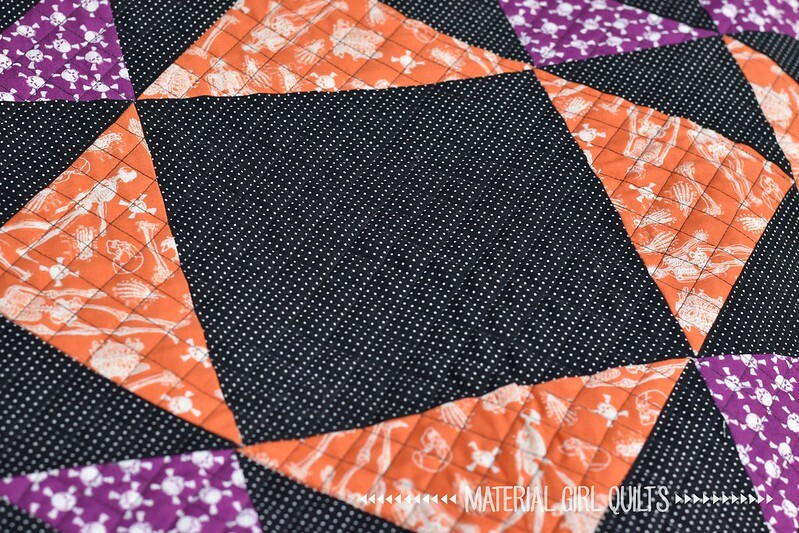 Just vary the colors and maybe use a motif print in the center.